Ever wondered what’s going on beneath the surface of a Piedmont region reservoir? 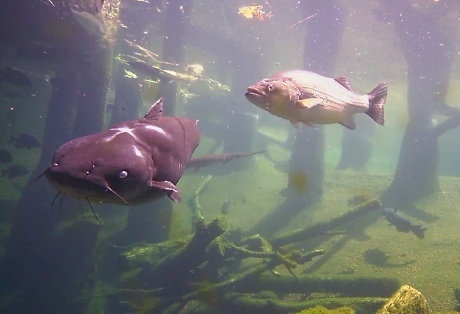 Now you can get a glimpse, thanks to an underwater camera streaming live HD video of bass, stripers, catfish and even an alligator snapping turtle in the largest tank at DNR’s Go Fish Education Center. The center, adjacent to the Georgia National Fairgrounds in Perry, is an educational wonderland of sport-fishing exhibits and freshwater aquariums featuring native fishes and aquatic habitats. A Georgia Natural Resources Foundation grant provided the camera. Staff recently installed it in the Piedmont Reservoir aquarium, 15 feet deep and full of fish, from trophy largemouths to longnose gar. Streaming live from 7 a.m.-7 p.m. daily, the camera offers a unique window into Georgia aquatics. Except for a long-missing loggerhead named Coral, sea turtle nesting in Georgia rated average in 2014. Not that average is bad for this threatened species and Georgia’s primary sea turtle. The 1,193 nests recorded through Labor Day fell far shy of the 2,289 counted last summer and ended a four-year run of nesting highs. But Georgia DNR Sea Turtle Program Coordinator Mark Dodd explained that while the 26-year average for loggerheads is 1,215 nests, a rise and fall in nesting is more normal than a string of annual increases. Nest totals also dropped by about half in South and North Carolina, according to news reports. But Florida, natal home for loggerheads genetically distinct from those in Georgia and the Carolinas, may match or top 2014. These massive turtles that can weigh up to 300 pounds and grow 3 feet long are a puzzler for predicting nest trends. Some nest once a year, but on average they nest every three or more years. A single loggerhead might lay and bury as few as one to as many as five egg clutches per summer at the base of beach dunes. 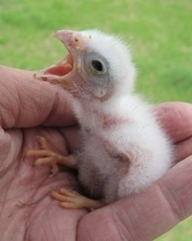 Nesting and clutch frequencies are likely linked to the abundance of prey, Dodd said. And then there are curveballs like Coral. 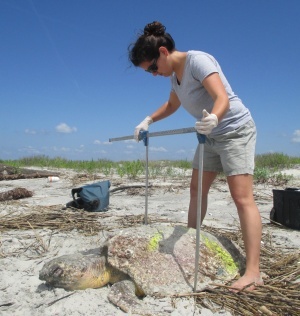 Fitted with a satellite transmitter on Sapelo Island in 2005, this turtle didn’t nest again in Georgia until this summer – laying eggs on Sapelo nine years later. Though Coral might have nested in a neighboring state, loggerheads usually return to the same area to nest, ties revealed in a University of Georgia and DNR study that is creating genetic profiles of loggerheads that nest in Georgia and the Carolinas. “It’s great to see some of the animals we have assumed might be gone from the population return and nest,” Dodd wrote. Labor Day is the unofficial end of nesting season – the last nest was Aug. 18 on Ossabaw Island – but hatching can continue into early October. 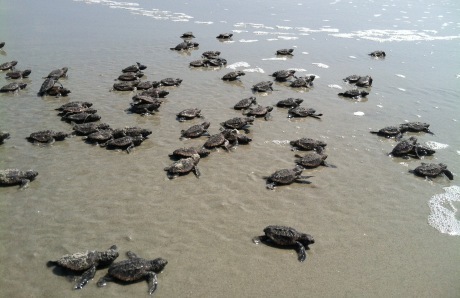 As of Sept. 12, the Georgia Sea Turtle Cooperative reported that 867 nests, more than 70 percent of this summer's total, had hatched. (Hatched nests include those listed as "emerged" and "inventoried.") Dodd says predation by mammals and tropical storm tidal surges are the leading threats to hatching success. Georgia was largely free of tropical storm impacts this summer. Predation was reined in by "nest screening and predator removal.” Track the hatch. Where do female loggerheads go after they nest in Georgia? They migrate to foraging habitat off the mid-Atlantic and northeastern U.S., a post-nesting migration Dodd calls impressive. Jewelweed is rarely found growing in Georgia backyards. 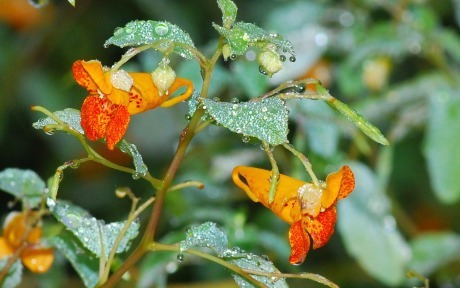 Jewelweed is one of our most beautiful native plants. It’s a great source of nectar eaten by hummingbirds and other nectar feeders. This annual also has long been valued for its purported medicinal properties. Instead of backyards, however, more often than not jewelweed is relegated to putting its roots down in roadside ditches and other wet, disturbed sites. But this is one jewel you can acquire without breaking your bank account! Read Terry’s column to learn more about jewelweed, including why hummingbirds favor it. Terry W. Johnson is a former Nongame program manager with the Wildlife Resources Division and executive director of TERN, the Nongame Conservation Section’s friends group. Column archives. Another 320 acres along Raccoon Creek tributaries in Paulding County will be protected, benefiting federally listed Etowah and Cherokee darters, as well as other wildlife. A $116,578 federal Recovery Land Acquisition Grant will help DNR acquire the tract rated critical for the long-term survival of the rare darters and also providing needed connectivity to other protected areas in the watershed, according to the U.S. Fish and Wildlife Service. 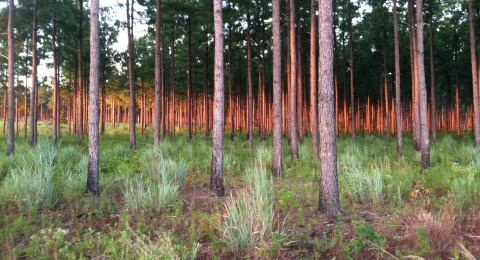 The acquisition, which will become part of Paulding Forest Wildlife Management Area, was announced as part of nearly $35 million in federal grants for states’ collaborative efforts to conserve imperiled species. Project list. The 2014 State of the Birds report released this week shows that many species found in Georgia are on the watch list – such as cerulean warblers, declining by 3 percent a year – while the state also shares in some conservation success stories, including the increase in American oystercatcher populations. One take-home message: Proactive conservation is the most effective way to keep common species common and less common ones from needing Endangered Species Act protection. The first Bat Blitz by the Georgia Bat Working Group had bats and bat lovers galore last weekend at Black Rock Mountain State Park. As part of a national effort to survey bats during the same week, some 60 people netted 18 sites on the park and surrounding public lands, capturing 123 bats, from 99 red bats to one northern long-eared bat, a candidate species for federal listing. Have satellite, will travel – and even provide data! Mottled ducks, which began showing up on the Georgia coast in the late 1990s, are being outfitted with satellite transmitters in an effort by the University of Georgia and DNR’s Wildlife Resources Division to learn more about the ducks’ habitat preferences and movement patterns, data that will help DNR manage coastal impoundments. Georgia rockress, a perennial herb numbering about 5,000 plants and found only in Georgia and Alabama, will be listed as threatened under the Endangered Species Act, according to the U.S. Fish and Wildlife Service. 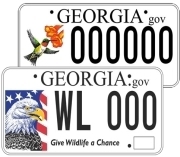 The listing and the designation of 732 acres of habitat as critical – including in Georgia’s Gordon, Floyd, Harris, Muscogee and Clay counties – becomes effective Oct. 14. About 1,500 acres in Georgia, Alabama and Tennessee will be designated as critical habitat for the endangered whorled sunflower. All of the critical habitat in Georgia is in Floyd County, owned by Plum Creek and protected by a conservation easement held by The Nature Conservancy. What was Smithgall Woodland Garden is now Atlanta Botanical Garden, Gainesville. 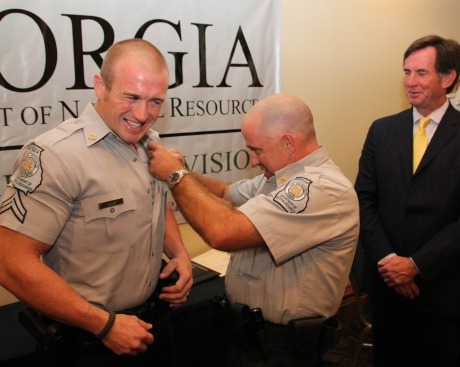 With the blessing of donor Lessie Smithgall, leaders decided to rename the 168-acre site in north Gainesville to emphasize its connection with Atlanta Botanical Garden – which is building the garden and will run its programs – and to avoid confusion with Smithgall Woods State Park near Helen. Southeastern American kestrels in middle Georgia’s Fall Line sandhills declined about 7 percent a year, with steep drops in the raptors' use of nest boxes, DNR aerial surveys from 2010-2014 show. Yet, Nongame senior wildlife biologist Nathan Klaus says surveys also revealed that a south Georgia kestrel population found along a powerline corridor from Georgia Power’s Plant Mitchell near Albany to Offerman in Pierce County grew 17 percent a year to 302 nesting pairs, possibly because the birds took advantage of nest sites provided by older powerline structures. In other bird news, Berry College has revealed that a second bald eagle nest on campus – not the one made famous by the school’s live-streaming cams – produced three eaglets this spring. Also, a project pushing the passenger pigeon documentary “From billions to none” on public television has taken off. Some 3,200 lake sturgeon fingerlings were released into the Conasauga River in Whitfield County this week by DNR fisheries staff. Started in 2002 in northwest Georgia rivers, the sturgeon releases are aimed at re-establishing these unique fish in their native range. Learn more. Want to go to BOW? The deadline for a scholarship to attend the Becoming an Outdoors-Woman program Nov. 7-9 at Charlie Elliott Wildlife Center in Mansfield has been extended to Oct. 10. Apply. Salamanders and wolf spiders have this in common: Both are key predators. Research shows that salamanders could be affecting carbon levels by eating bugs that shred leaves and thus release carbon and methane, while UGA scientists have discovered that wolf spiders are taking advantage of cover provided by invasive Japanese stiltgrass to prey on American toads, undercutting toad survival rates. Clarification: DNR's Mincy Moffett took the Aug. 25 Georgia Wild photograph of Shan Cammack installing a sign at Ohoopee Dunes Wildlife Management Area. Sept. 19-21 – Women in the Outdoors, Georgia FFA Center, Covington. Sept. 27 – Your State Parks Day, free admission to Georgia’s State Parks & Historic Sites, statewide. says that five years ago volunteers hand-collected Indian grass seed from a nearby site. Klaus and DNR's Alan Isler then planted the plugs, raised at a nursery, on a January day. eight to 12 pairs of the sparrows were found at Fall Line in 2005. The estimate this year: 40-plus!